McKee's 37 Trademark Extender Spray Wax, 8 oz. McKee's 37 Trademark Extender Spray Wax is a polymer-infused, synthetic formula designed to enhance shine, extend paint protection, and provide a slick finish that resists dust and dirt build up. Use this gloss-intensive spray wax on all exterior surfaces ' paint, wheels, glass, chrome, and plastic trim. This advanced formula uses a proprietary blend of super slippery polymers designed to create an extremely slick, glassy finish that complements all colors. Formulated in the hot, humid climate of south Florida, Trademark Extender Spray Wax is guaranteed not to streak, smear, or smudge ' even in direct sunlight! Extends and enhances the look, feel, and protection provided by all waxes and paint sealants. Non-Streak formula, even in direct sun! McKee's 37 is headquartered in Stuart, Florida, better known as the sunshine state! Our entire product line is developed in this tropical climate that we're proud to call home, so we know a thing or two about creating a spray wax that will not streak! 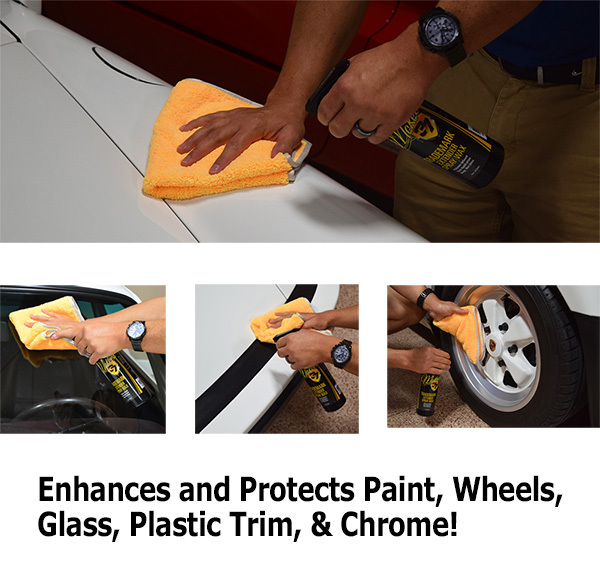 McKee's 37 Trademark Extender Spray Wax, even used in direct sunlight on a sizzling summer afternoon, will not streak on paint, glass, chrome, or wheels ' we guarantee it! Don't let the name confuse you ' Trademark Extender Spray Wax is not a sprayable version our famous Trademark Carnauba Paste Wax. In fact, it has nothing in common with it! The Trademark name was the obvious choice for this gloss-intensive, slippery synthetic spray wax because it represents the pinnacle of our product line, where the Trademark name is only given to the finest products that bear our gold shield of quality. Trademark Extender Spray Wax is a 100% synthetic formula. Now that any possible confusion has been cleared up, let me make one thing clear: Trademark Extender Spray Wax is phenomenal! It is hands-down the best spray wax you'll ever use, PERIOD! Use Trademark Extender Spray Wax as a stand-alone paint protectant, or as a secondary product to maintain our vast line of waxes, sealants, and coatings. Trademark Extender Spray Wax is 100% compatible with our entire line up. In fact, it extends the gloss, extends the protection, and extends the smiles every time you use it. You're going to love it! Are you a fan of tight, round water beading? Trademark Extender Spray Wax is for you! Not only does Trademark Extender Spray Wax create mile-deep reflections on painted surfaces, it blankets treated surfaces with a super slippery, hydrophobic shell of protection that provides relentless water beading. Use it on glass and water will bead up and fly off at highway speeds. Directions: For the best protection possible, wash and dry vehicle prior to using Trademark Extender Spray Wax. Working one panel at a time (a hood or roof is considered two panels), spray directly onto surface. Immediately wipe the wax away using a clean, soft microfiber towel. As your towel becomes saturated with product, switch to a new towel. To use as a detail spray at a car show, simply spray more product onto each panel to provide additional lubrication. McKee's 37 Trademark Extender Spray Wax 128 oz.